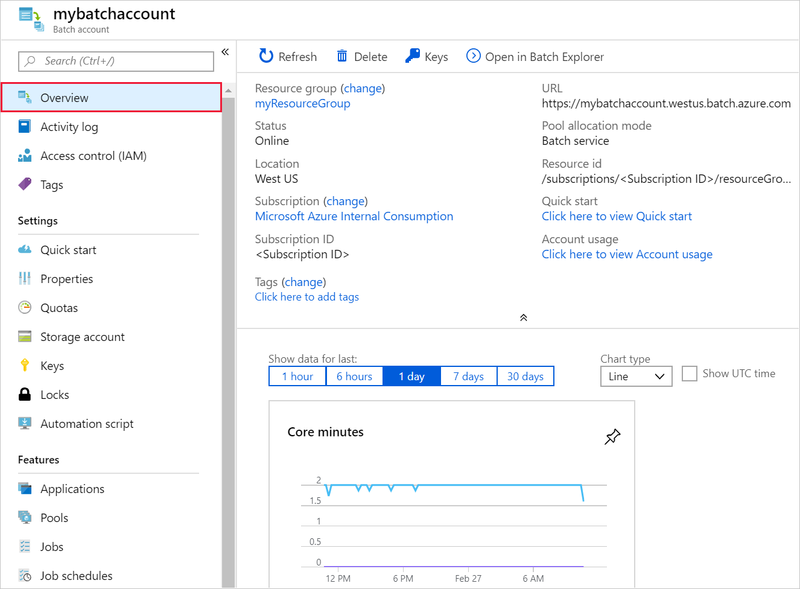 Learn how to create an Azure Batch account in the Azure portal, and choose the account properties that fit your compute scenario. Learn where to find important account properties like access keys and account URLs. For background about Batch accounts and scenarios, see the feature overview. When creating a Batch account, you can choose between two pool allocation modes: user subscription and Batch service. 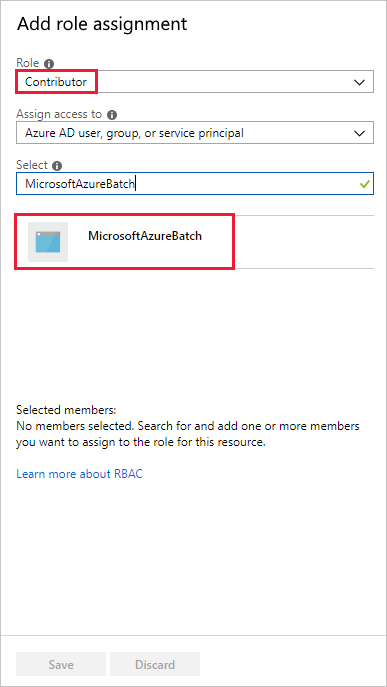 For most cases, you should use the default Batch service mode, in which pools are allocated behind the scenes in Azure-managed subscriptions. In the alternative user subscription mode, Batch VMs and other resources are created directly in your subscription when a pool is created. 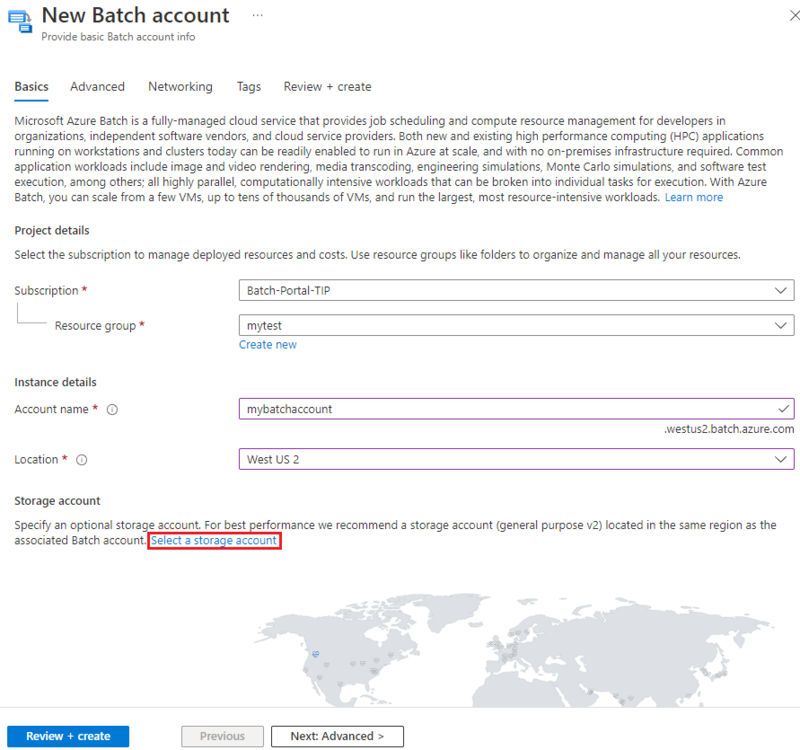 User subscription mode is required if you want to create Batch pools using Azure Reserved VM Instances. 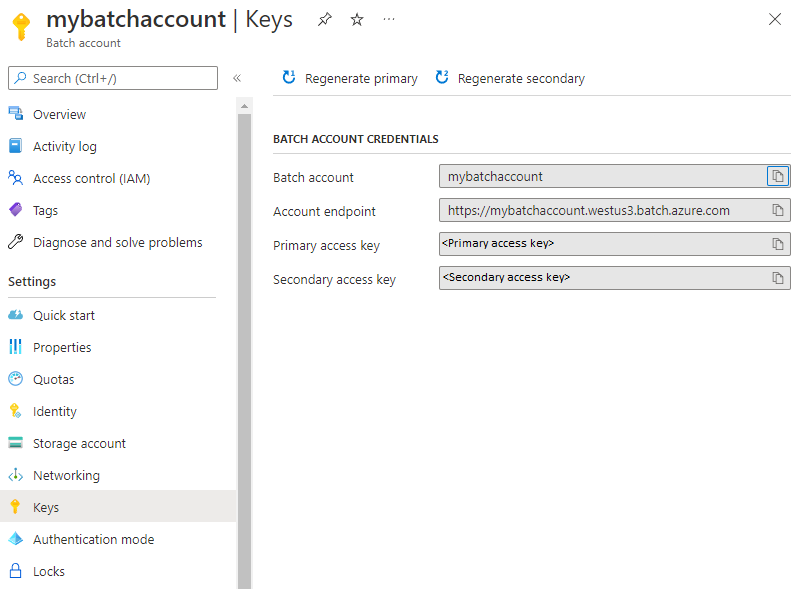 To create a Batch account in user subscription mode, you must also register your subscription with Azure Batch, and associate the account with an Azure Key Vault. Select Create a resource > Compute > Batch Service. Enter New Batch account settings. See the following details. a. Subscription: The subscription in which to create the Batch account. If you have only one subscription, it is selected by default. b. Resource group: Select an existing resource group for your new Batch account, or optionally create a new one. c. Account name: The name you choose must be unique within the Azure region where the account is created (see Location below). The account name can contain only lowercase characters or numbers, and must be 3-24 characters in length. d. Location: The Azure region in which to create the Batch account. Only the regions supported by your subscription and resource group are displayed as options. e. Storage account: An optional Azure Storage account that you associate with your Batch account. A general-purpose v2 storage account is recommended for the best performance. 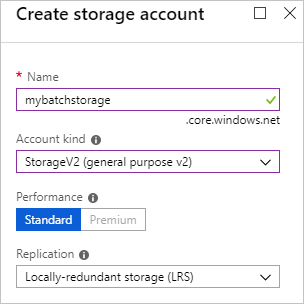 For all storage account options in Batch, see the Batch feature overview. In the portal, select an existing storage account, or create a new one. f. Pool allocation mode: In the Advanced settings tab you can specify pool allocation mode as Batch service or User subscription. For most scenarios, accept the default Batch service. Select Create to create the account. Once the account has been created, select the account to access its settings and properties. You can access all account settings and properties by using the left menu. To view the Batch account access information, select Keys. To view the name and keys of the storage account associated with your Batch account, select Storage account. To view the resource quotas that apply to the Batch account, select Quotas. For details, see Batch service quotas and limits. If you choose to create a Batch account in user subscription mode, perform the following additional steps before creating the account. Select All services > Subscriptions, and select the subscription you want to use for the Batch account. In the Subscription page, select Resource providers, and search for Microsoft.Batch. Check that the Microsoft.Batch resource provider is registered in the subscription. If it isn't registered, select the Register link. In the Subscription page, select Access control (IAM) > Role assignments > Add role assignment. Microsoft Azure Batch. Newer Azure AD tenants may use this name. ddbf3205-c6bd-46ae-8127-60eb93363864 is the ID for the Batch API. Once you find the Batch API, select it and select Save. 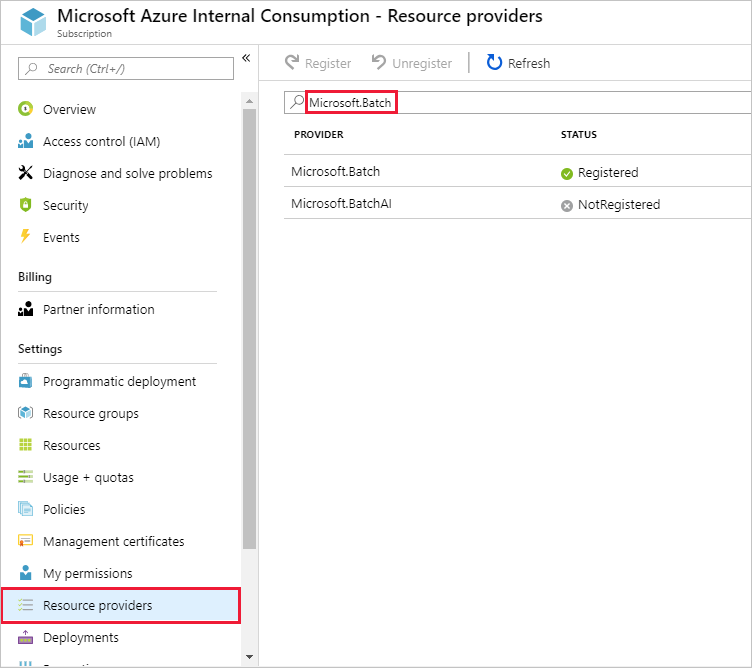 In user subscription mode, an Azure key vault is required that belongs to the same resource group as the Batch account to be created. Make sure the resource group is in a region where Batch is available and which your subscription supports. In the Azure portal, select New > Security > Key Vault. In the Create Key Vault page, enter a name for the key vault, and create a resource group in the region you want for your Batch account. Leave the remaining settings at default values, then select Create. When creating the Batch account in user subscription mode, use the resource group for the key vault, specify User subscription as the pool allocation mode, and select the key vault. Core quotas are not set by default on user subscription Batch accounts. Core quotas must be set manually because standard Batch core quotas do not apply to accounts in user subscription mode. In the Azure portal, select your user subscription mode Batch account to display its settings and properties. From the left menu, select Quotas to view and configure the core quotas associated with your Batch account. Refer to the Batch service quotas and limits for more information on user subscription mode core quotas. See the Batch feature overview to learn more about Batch service concepts and features. The article discusses the primary Batch resources such as pools, compute nodes, jobs, and tasks, and provides an overview of the service's features for large-scale compute workloads. Learn the basics of developing a Batch-enabled application using the Batch .NET client library or Python. 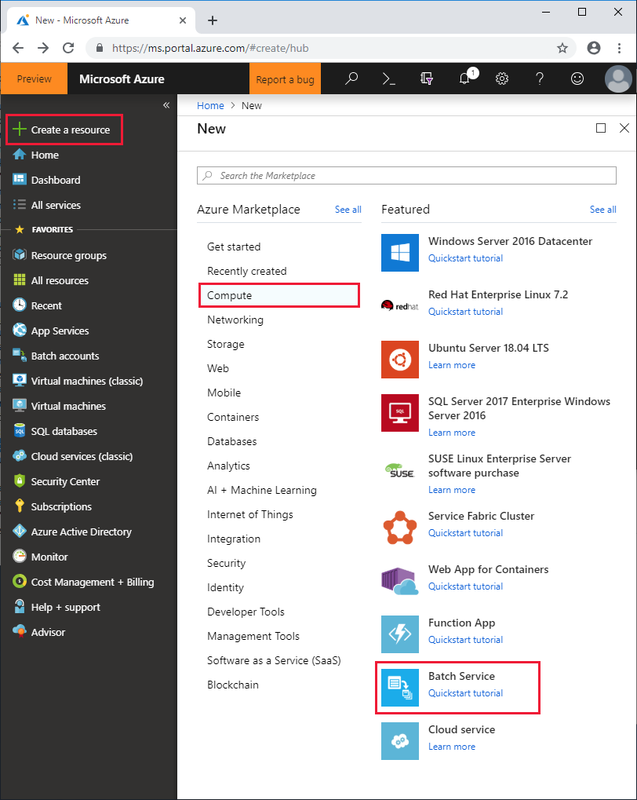 These quickstarts guide you through a sample application that uses the Batch service to execute a workload on multiple compute nodes, and includes using Azure Storage for workload file staging and retrieval.